We are taking pre-orders for our new Nestlé-Free Zone t-shirt for delivery in September. Take a look at the t-shirt and other items in our online Virtual Shop. 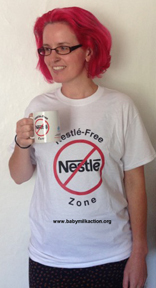 The Nestlé-Free Zone logo is also available on mugs, keyring and fridge magnets. Explore the different shop departments.